Be Prepared, Always Carry a Spare! If you lose or break your kill switch key, for whatever reason, you won't be able to start your engine. Most marinas don't stock replacement keys, so your much-deserved day out on the boat will be ruined. 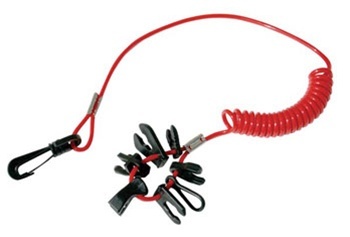 This lanyard has 7 keys to fit all BRP, Johnson, Evinrude, Mercury, Yamaha, Honda, Tohatsu, Nissan and Suzuki kill switches. It's equipped with a swivel snap hook to prevent tangles, and rust-free stainless steel crimps.